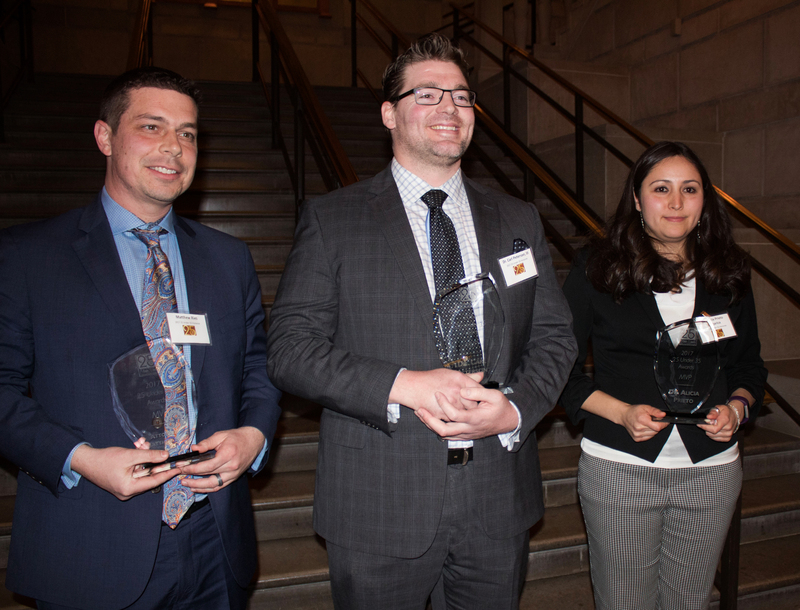 A Youngstown State University professor was given the MVP award at the 25 Under 35 Awards Ceremony at the Stambaugh Auditorium on Feb. 9. From left to right; Matthew Ries, Carl Peterson and Alicia Prieto Langarica. The Mahoning Valley Young Professionals nominated 25 young professionals who are making achievements in their fields of study. Alicia Prieto Langarica, YSU math professor, was selected as one of the three MVP winners. Mercy Health Care oncologist Carl Peterson and Harrington, Hoppe & Mitchell, Ltd. attorney Matthew Ries were also selected MVPs. Prieto Langarica is the first YSU faculty member to win the MVP award in years. Prieto Langarica has been an associate professor at YSU since 2012. She moved to the United States from Mexico in 2006, earning her bachelor’s degree at the University of Texas at Dallas and her doctorate in mathematics at the University of Texas at Arlington. Since starting at YSU four years ago, Prieto Langarica said she has been impressed by all of the students and their success at YSU. “I taught in Texas before when I was getting my Ph.D. and students there feel so entitled and they kind of go to school for the college experience, and here students come and … they work so hard and they’re so smart,” Prieto Langarica said. Prieto Langarica was recognized at the ceremony for advising students and taking them to national and regional conferences in Atlanta and Washington, D.C. to present research. She said it has been a privilege to spend time with her students. Associate Professor Thomas Wakefield nominated Prieto Langarica to be a nominee. In a previously recorded video played at the ceremony, Wakefield said the department and community are fortunate to have her. The number of women who have gone into mathematics at YSU has increased since she started, Prieto Langarica said. She hopes that this will continue to be the case. “We always try to encourage women to do math, which is not the norm everywhere,” Prieto Langarica said. 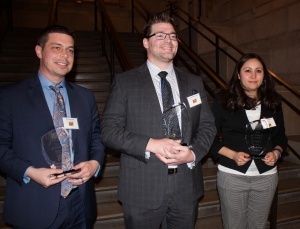 The Mahoning Valley Young Professionals organized the 25 Under 35 Ceremony. Shannon Renfro, president of the MVYP, said each nominee is given a yearlong membership to the group and the MVYP will give support to the volunteer organizations that the nominees are passionate about.